The notion that the best marriages are those that bring satisfaction to the individual may seem counterintuitive. After all, isn’t marriage supposed to be about putting the relationship first? Not anymore. For centuries, marriage was viewed as an economic and social institution, and the emotional and intellectual needs of the spouses were secondary to the survival of the marriage itself. But in modern relationships, people are looking for a partnership, and they want partners who make their lives more interesting. Caryl Rusbult, a researcher at Vrije University in Amsterdam who died last January, called it the “Michelangelo effect,” referring to the manner in which close partners “sculpt” each other in ways that help each of them attain valued goals. Dr. Aron and Gary W. Lewandowski Jr., a professor at Monmouth University in New Jersey, have studied how individuals use a relationship to accumulate knowledge and experiences, a process called “self-expansion.” Research shows that the more self-expansion people experience from their partner, the more committed and satisfied they are in the relationship. While the notion of self-expansion may sound inherently self-serving, it can lead to stronger, more sustainable relationships, Dr. Lewandowski says. The concept explains why people are delighted when dates treat them to new experiences, like a weekend away. But self-expansion isn’t just about exotic experiences. Individuals experience personal growth through their partners in big and small ways. It happens when they introduce new friends, or casually talk about a new restaurant or a fascinating story in the news. The effect of self-expansion is particularly pronounced when people first fall in love. Inresearch at the University of California at Santa Cruz, 325 undergraduate students were given questionnaires five times over 10 weeks. They were asked, “Who are you today?” and given three minutes to describe themselves. They were also asked about recent experiences, including whether they had fallen in love. After students reported falling in love, they used more varied words in their self-descriptions. The new relationships had literally broadened the way they looked at themselves. Over time, the personal gains from lasting relationships are often subtle. Having a partner who is funny or creative adds something new to someone who isn’t. A partner who is an active community volunteer creates new social opportunities for a spouse who spends long hours at work. 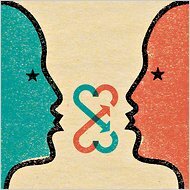 Additional research suggests that spouses eventually adopt the traits of the other — and become slower to distinguish differences between them, or slower to remember which skills belong to which spouse. In experiments by Dr. Aron, participants rated themselves and their partners on a variety of traits, like “ambitious” or “artistic.” A week later, the subjects returned to the lab and were shown the list of traits and asked to indicate which ones described them. People responded the quickest to traits that were true of both them and their partner. When the trait described only one person, the answer came more slowly. The delay was measured in milliseconds, but nonetheless suggested that when individuals were particularly close to someone, their brains were slower to distinguish between their traits and those of their spouses. It’s not that these couples lost themselves in the marriage; instead, they grew in it. Activities, traits and behaviors that had not been part of their identity before the relationship were now an essential part of how they experienced life. We don’t need to be smart to survive! This might explain the economic, social and environmental mess we are midst of today. It’s not something we’d like to admit, but it seems the human race may actually be becoming increasingly dumb. Man’s brain has been gradually shrinking over the last 20,000 years, according to a new report. This decrease in size follows two million years during which the human cranium steadily grew in size, and it’s happened all over the world, to both sexes and every race. ‘Over the past 20,000 years, the average volume of the human male brain has decreased from 1,500 cubic centimetres to 1,350 cubic centimetres, losing a chunk the size of a tennis ball,’ Kathleen McAuliffe writes in Discover magazine. She was reporting on comments made by Dr John Hawks, an anthropologist from the University of Wisconsin, who argues that the fact the size of the human brain is decreasing doesn’t necessarily mean our intelligence is in decline as well. Some paleontologists agree with this diagnosis, that our brains may have become smaller in size, but increasingly efficient. But others believe that man has indeed become steadily more stupid as he has evolved. Several theories have been advanced to explain the mystery of the shrinking brain. 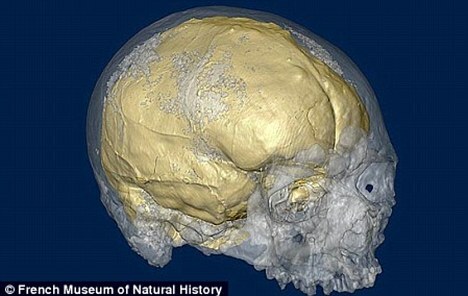 One is that big heads were necessary to survive Upper Paleolithic life, which involved cold, outdoor activities. A second theory is that skulls developed to cope with a chewy diet of rabbits, reindeer, foxes and horses. As our food has become easier to eat, so our heads have stopped growing, according to supporters of this theory. gradually decreasing infant mortality rate has led to a proportionate decrease in the size of our brains. A recent study conducted by David Geary and Drew Bailey, cognitive scientists at the University of Missouri, explored how cranial size changed as humans adapted to an increasingly complex social environment between 1.9million and 10,000 years ago. They found that when population density was low, such as during the majority of our evolution, the cranium increased in size. But when a certain area’s population changed from sparse to dense, our cranium size decreased. They concluded that as increasingly complex societies emerged, the brain grew smaller because people didn’t have to be as smart to stay alive. But Dr Geary warns against stereotyping our ancestors as being more intelligent than us. He said: ‘Practically speaking, our ancestors were not our intellectual or creative equals because they lacked the same kind of cultural support. ‘The rise of agriculture and modern cities based on economic specialisation has allowed the very brightest people to focus their efforts on the sciences, the arts and other fields. Dr Hawks, on the other hand, believes that the decrease in the size of our brains may actually show we are getting more intelligent. The brain, he says, uses up to 20 per cent of all the fuel we consume. Therefore a bigger brain will require more energy and take longer to develop. Dr Hawks notes that a boom in the human population between 20,000 and 10,000 years ago led to an unusual advantageous mutation to take place. He believes this could have resulted in the brain becoming more streamlined, our neurochemistry shifting to boost the capacity of our brains. But it seems the size of our brains could be on the increase again. A recent study by anthropologist Richard Jantz of the University of Tennessee found that our brain size is on the increase again. He measured and compared the craniums of Americans of African and European descent from late colonial times to the 20th century and found that our brain size is on the move again. You are currently browsing the Of Times Now and Then blog archives for January, 2011.